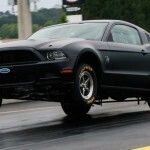 2014 Ford Mustang Cobra Jet: First Official Test Run! 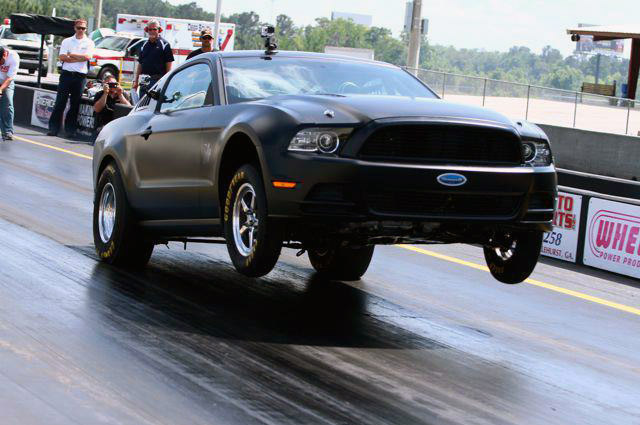 After the announcement of the renewed version of 2014 Ford Mustang Cobra Jet, Ford racing finished the primary stage of the process last week at Motorsports Park in Adel, GA. Andy Vrenko, the Ford Racing chassis engineer, and Evan Smith, the editor of Muscle Mustang and Fast Fords, took the car for a test drive in order to make several evaluations so that the vehicle shall perform better on the road. The updated 2014 Ford Mustang Cobra Jet did get some new features such as: new roll cage, better Racaro FIA race seats, updated suspension, electric power steering and a parachute mount. And the last but not the least, two new colors (Matte black and Gotta Have It Green) were also made. The robust 5.0-liter V8 is the only thing that remained the same from the 2013 model. It can be found in natural and supercharged form. The test ceremonial was made in memoriam of Rob Deneweth, a former engineer, who passed away quite recently. 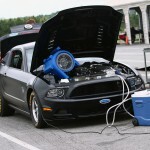 Deneweth was the designer of the powertrain for the Cobra Jet and had a main role when creating the twin-turbo Cobra Jet Concept. Deneweth`s name is written on the back of the Cobra Jet. Anyway, how do you like the rims on this Stang! ?